To be honest, I wasn't really that excited to read this book. I've seen a couple versions of the movie and know of the hype about Colin Firth. (Don't get me wrong ... it was a brilliant choice to cast him as Mr. Darcy.) But I always just put Pride and Prejudice in the category of "overblown" pop culture. I thought I'd read it and wonder what everyone was so gaga over it for. Jane Austen, I'm so sorry. Your book is worthy of the hype. See for me, a book lives or dies almost entirely on the characters. If I connect with them - their lives, their stories, their choices, fears, hopes and dreams - then I love the book. If I don't understand or respect them, I don't like the book. It's really pretty simple. Pride and Prejudice has two of the best characters of any book I've ever read. Basically, I have a crush on Mr. Darcy and I wish I was Elizabeth Bennet. 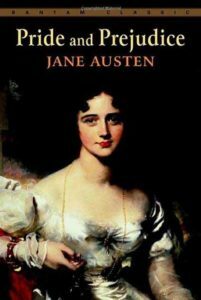 So thank you, Jane Austen, for creating characters that made me fall in love with your book. And for teaching me that every once in a while, the hype is for real.